The internet was created with the intention of connecting the world, and it has done just that. For most of us, the internet is where we now spend hours on the apps, platforms and sites that make our lives easier, more connected, and fun. On average, a person spends over 4 hours online and that in itself is likely more time than most of us spend with their friends, have family meals, or even sit in traffic. The internet is an amazing tool that has become a necessity in our lives. We take it for granted, and most of us can’t even fathom a modern world where it doesn’t exist. A look at the Betfy’s real-time statistics on what powers the internet is an incredible look into just how much data, traffic, money and time is spent online. In a single hour, over a billion messages are sent via the messaging app WhatsApp, and 7.8 million calls are made through Skype. This alone represents how global communication has changed the way we live in terms of connectivity and convenience. When it comes to entertainment, the internet is a playground that is used more than any other means for playing games, watching content and even gambling. The business and commerce implications of mass internet usage are also amazing. Ecommerce makes up a huge portion of the economy and the sector is outgrowing offline commerce nearly 3-to-1 every year. In terms of raw numbers, in a single hour the internet facilitates 82,000 rides through Uber, 43,000+ bookings on AirBnB, and thousands of flights via SkyScanner. In terms of transferring money, a single hour online sees billions transfer electronically. 104,184 Bitcoins alone are transferred every 60 minutes. PayPal, the world’s top online payment processor, is used for $32.1 million in payments per hour. These numbers are just the tip of the iceberg. They represent how the internet has evolved to become an intrinsic part of our lives and how it commands our time as a society. They also show trends for future development. 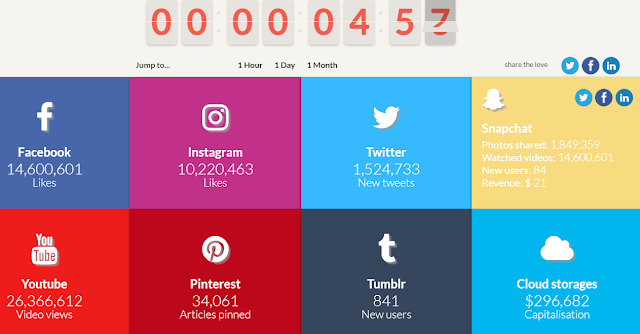 I hope you enjoyed this article and infographic about how our time is increasingly spent online. Interested in more articles about digital media and tech?